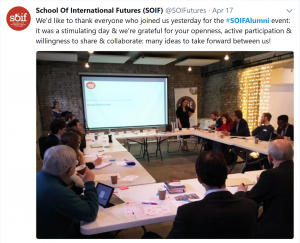 It’s been a week since our Strategic Foresight ‘Support and Inspire’ Alumni event held at Newspeak House in London​. 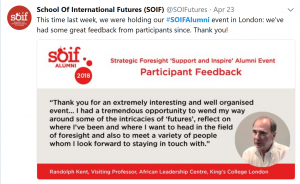 Supporting our SOIF community of practice is something we wholeheartedly enjoy and this was a great opportunity for members of our community to come together and learn from what fellow alumni have been doing in the foresight field. Attendees shared insights on key futures issues and challenges, and also ideas on how to build personal and organisational excellence in foresight. the art of balancing experience and history with systematic and structured approaches to the future with an appreciation of synchronicity. We’d love to hear your thoughts and we look forward to sharing more insights from the day in future posts.